South Africa’s Somali community is a community of self-sufficient, law-abiding citizens. These people have learned the consequences of non-tolerant radicalised societies and their moderation continues to hold true despite being victims of xenophobic and criminal attacks resulting in about 40 deaths to date in 2017 alone. By DAVID BAX. The recent bombing in Mogadishu, when an improvised explosive device built on the back of a truck exploded in a vulnerable location killing as many as 400 people, points to the incompetence, coercion and collusion from security officials at checkpoints. A bomb of the magnitude used in the attack requires a large truck to carry, and concealment is very difficult. The weakness in the security envelope around Mogadishu is, however, only part of the problem. The security forces and the African Union (AU) allies — logistically supported by the United Nations — have never tried to expel al-Shabaab from more than the main towns and villages, allowing the Shabaab fighters to build bombs, train and attack almost at will. In the last few years, they have repeatedly attacked AU camps, resulting in many hundreds of deaths among the peacekeepers. If Somalia is not to slide further into chaos, to be effective, the Somalian government must gain control of all the areas in Somalia it does not currently govern and reduce the ability of al-Shabaab to plan and carry out further attacks. What would help a great deal is social cohesion and media pressure. The people must feel that the social compact between their leaders and the people is being upheld because without this compact, Somalia will never achieve stability. It is as much about the security of peacekeeping as it is an effort of educating, mobilising and leading a country in a new direction and also, quite simply, addressing the needs of the people. In view of the civil war that broke out in Somalia in 1991, and the violent attacks by Islamic fundamentalists like al-Shabaab, it is not surprising, therefore, that several hundred thousand Somalis have fled to South Africa seeking safety and security. Many have found some measure of success in operating small stores and spaza shops in townships across the country. According to the UNHCR, there were almost 310,000 refugees and asylum seekers in the country as of July 2014. By the end of 2015, this number was expected to top 330,000 with as many as 60,000 to 80,000 seeking asylum each year. However divided, unequal and structurally flawed, South Africa is home to a very diverse population of people. It remains attractive as a home for migrants, many of them seeking greener economic pastures, safety and security. A national survey of the attitudes of the South African population towards foreign nationals in the country, conducted by the South African Migration Project as early as 2006 found xenophobia to be widespread— resulting in violent attacks on foreign nationals. South Africans do not want it to be easier for foreign nationals to trade informally (59% opposed), to start small businesses in South Africa (61% opposed) or to obtain South African citizenship (68% opposed). At the heart of the township battles, however, is the dereliction of government’s duty to its people that has spurred the resentment towards foreign nationals here, culminating in the violent looting of foreign-owned stores. The South African population expects a lot from the government—many can still not speak about the “fruits of democracy” and the South African townships are often scenes of daily pandemonium with residents protesting against poor service delivery, low levels of development or painfully slow improvements to their quality of life. Social scientists have warned that it is this desperate level of inequality that continues to drive resentment and instability. There are lessons to be learned from Somalia. The attacks on foreigners do not happen in a vacuum, nor can they be explained simply by a hatred of all things foreign. There are many factors in play, from the negative perceptions of justice and the rule of law in the affected communities and the poor relationship between communities and the police and the wider judicial system. To the lack of convictions in cases of violence against foreign nationals in South Africa — stripping the government’s approach through the criminal justice system of any efficacy. The South African Constitution, along with various international treaties ratified by the South African government, ensures the protection of all persons who reside within the country from violations to their right to liberty and security of person. And when it comes to cases of violence against foreigners the State is particularly obliged to protect the victims from individuals who perpetrate the violence. South Africa has observed the rise of violent extremism globally and the profound impact this has had on countries and communities. For many years, this seemed a problem for “other countries”. But the arrest in Turkey of an ISS member bound for Johannesburg and other developments have changed this viewpoint. Conflicts can swiftly spiral out of control and affect other areas. Resilience in communities — measurable across indicators including: religion, health, access to credible law enforcement, criminality fuelled by drugs and gang-related activity, xenophobia and violent extremism— is eroded by the negative impacts of violence. The ongoing xenophobic attacks in certain towns of South Africa, have resulted in the internal displacement of foreign-born nationals who for the most part are very anxious that civil society views them as “good people” and “good communities”. An example of this is the South African Somali community — a community of self-sufficient, law-abiding citizens. These people have learned the consequences of non-tolerant radicalised societies and their moderation continues to hold true despite their being victims of repeated and terrible xenophobic and criminal attacks resulting in approximately 40 deaths to date in 2017 alone. It is far more cost-effective to redirect members of society away from violent extremism by addressing the root causes of dissatisfaction or offering alternative directions that do not manifest themselves in anti-social or criminal outcomes before radicalisation sets in. Less effective is trying to remedy the situation after the fact. Radicalisation is not only present in certain communities such as the Islamic communities — all communities can produce this extremism in certain circumstances. Examples of this are the upsurges in violent right-wing behaviour, the consequences of which are seen in Europe such as the increases in anti-Semitic activity and the targeting of other immigrant communities. Understanding the drivers of violent extremism and the communities at risk of radicalisation is crucial — social media’s role in propagating negative messages and exacerbating existing tensions should not be underestimated. The implementation of mitigating actions can be an efficient way of denying fertile ground to radicalisation. Vulnerable communities must be identified and given additional resources to address the causes that have the potential to enable violent extremism to take root. There are important roles for government, civil society, social media and many other players. The stigmatisation of certain communities along national or religious lines only serves to drive important issues underground. David Bax is the Director of ALPS Resilience, a non-profit that focuses on issues of forced migration and violent extremism in Southern Africa. Before joining ALPS Resilience in 2015, he spent 18 years on field missions for the United Nations, leading the establishment of the UNMAS Somalia programme in 2007. He established the first UN and permanent international presence in Mogadishu after the infamous “Black Hawk Down” incident and withdrawal of the international community in 1993. Photo: A man runs through the scene of a massive explosion in front of the Safari Hotel in the capital Mogadishu, Somalia, 14 October 2017. 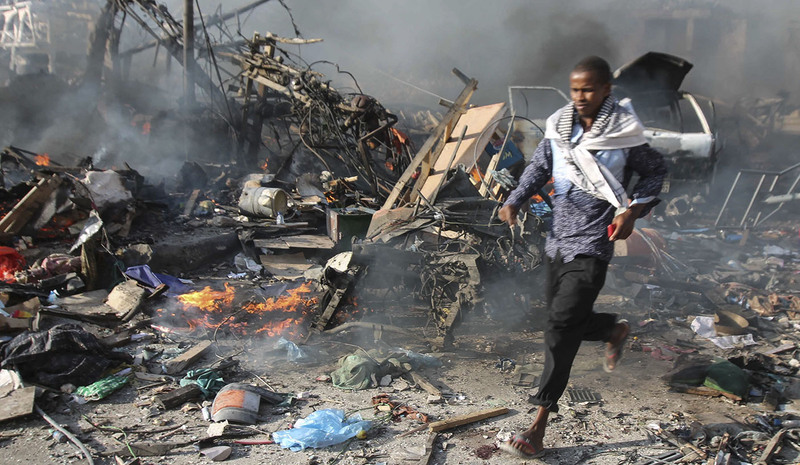 Hundreds of people were killed in the truck bomb attack, the deadliest attack in Somalia’s recent history. Photo: Said Yusuf Warsame/(EPA-EFE).